Prototype: German Federal Railroad (DB) class 111 electric locomotive in an S-Bahn version. Version with single-arm pantographs and rectangular buffers. Road number 111 162-4. The locomotive looks as it did in 1995. Servomechanism to raise and lower pantographs in digital operation included. Model: The locomotive has an mfx+ digital decoder with extensive sound functions. It also has controlled, high-efficiency propulsion. 2 axles powered. Traction tires. The triple headlights and dual red marker lights change over with the direction of travel, will work in conventional operation, and can be controlled digitally. The headlights at Locomotive End 2 and 1 can be turned off separately in digital operation. When the headlights are off at both ends of the locomotive, then the double "A" light function is on at both ends. The cab lighting can also be controlled digitally. Maintenance-free warm white and red LEDs are used for the lighting. The locomotive has a servomechanism to raise and lower each pantograph in digital operation. Length over the buffers approximately 19.1 cm / 7-1/2". 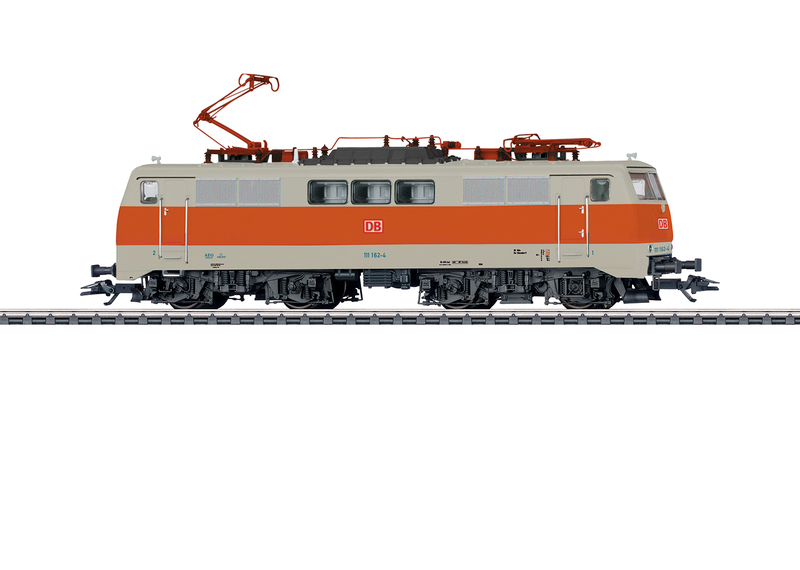 A passenger car set to go with this locomotive can be found in the Märklin H0 assortment under item number 43890. T Märklin close couplers in standard pocket with pivot point.